CBI - China: Day 30 of 154 of the Japanese Invasion of Manchuria. Spain: Day 93 of 985 of the Spanish Civil War. Spain: Day 458 of 985 of the Spanish Civil War. CBI - China: Day 103 of 2,987 of the 2nd Sino-Japanese War. Day 66 of 106 of the 2nd Battle of Shanghai. Day 47 of 70 of the Battle of Taiyuan. Spain: Day 823 of 985 of the Spanish Civil War. CBI - China: Day 468 of 2,987 of the 2nd Sino-Japanese War. Day 129 of 139 of the Battle of Wuhan. Day 6 of 81 of Japan's Operation GUANGDONG. ETO - Germany: Invading French troops are pushed back into the Saar region by the Germans. CBI - China: Day 833 of 2,987 of the 2nd Sino-Japanese War. ETO - UK: Day 42 of 258 of the Blitz. ETO - UK: Day 100 of 114 of the Battle of Britain. East Africa: Day 130 of 537 of Italy's East African campaign in the lands south of Egypt. CBI - China: Day 1,199 of 2,987 of the 2nd Sino-Japanese War. Day 338 of 381 of the Battle of South Guangxi. CBI - Thailand: Day 17 of 221 of the Franco-Thai War (Vichy France vs Thailand). 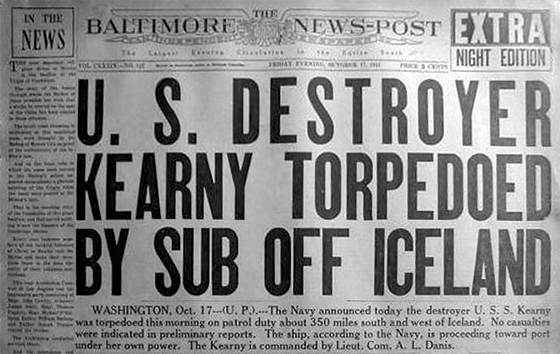 Atlantic: The destroyer USS KEARNY is damaged by a German torpedo off Iceland. America is outraged, but does nothing. The attack on the United States gunboat USS PANAY on 12 Dec 37 by Japanese forces in China (usually referred to as the Panay incident) could be considered as the first hostile American action during World War II. Although the war was not officially declared in Europe until Germany invaded Poland on 01 Sep 39, Japan had been involved in military actions against China since 1931. The first American military death in the European Theatre occurred on 21 Apr 40, during the German invasion of Norway. Military attaché Robert M Losey was killed during a German bombardment of Dombås while assisting with the evacuation of US embassy personnel and others to Sweden. Either the casualties inflicted on USS KEARNY by U-boat U-568 on 17 Oct 41 or the sinking of the USS REUBEN JAMES by U-552 on 31 Oct 41 might be considered the first American naval losses of World War II. The United States was neither officially involved in the war at the time nor did the incidents cause them to declare war. 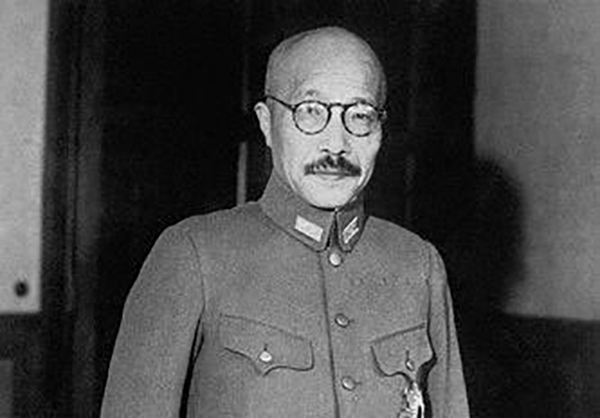 PTO - Japan: Minister of War Hideki Tojo is appointed Prime Minister, replacing Konoe Fumimaro. Tojo pledges his government to a Greater East Asia program, a "New Order in Asia." Politically, Tojo was fascist, nationalist and militarist, and was nicknamed "Razor" for his reputation for a sharp, legalistic mind capable of making quick decisions. His only real combat experience came in July of 1937 when, as Chief of Staff, he personally led units of the 1st Independent Mixed Brigade in the Inner Mongolia border regions with Manchukuo. He was a strong supporter of the Tripartite Pact between Imperial Japan, Nazi Germany, and Fascist Italy, yet he accepted tens of thousands of Jewish refugees into Manchukuo and Japanese-occupied areas of China and rejected the resulting Nazi German protests. On 03 Aug 40, a Japanese luxury ocean liner dropped off 82 Jewish refugees in Seattle, again snubbing their Axis partners. As the Army Minister, Tojo continued to expand the war with China. After negotiations with Vichy France, Japan was given permission to place its troops in French Indochina in July 1941. In spite of its formal recognition of the Vichy government, the United States retaliated against Japan by imposing economic sanctions in August, including a total embargo on oil and gasoline exports. As Prime Minister, Tojo served concurrently at times as Army Minister, Home Minister, Foreign Minister, Education Minister and Minister of Commerce and Industry. As Education Minister, he continued militaristic and nationalist indoctrination in the national education system, and reaffirmed totalitarian policies in government. As Home Minister, he ordered various eugenics measures, including the sterilization of the "mentally unfit." His popularity was sky-high in the early years of the war, as Japanese forces went from one great victory to another. However, after the Battle of Midway, with the tide of war turning against Japan, Tojo faced increasing opposition from within the government and military. To strengthen his position, in February 1944, he assumed the post of Chief of the Imperial Japanese Army General Staff. However, after the fall of Saipan, he was forced to resign on July 18, 1944. After Japan's unconditional surrender in 1945, US general Douglas MacArthur issued orders for the arrest of the first forty alleged war criminals. Tojo was at the top of the list. Russian Front - Finland: Day 111 of 142 of Operation SILVER FOX, a joint German-Finnish campaign to capture the Russian port of Murmansk in the Arctic. Russian Front - Finland: Day 109 of 140 of Operation ARCTIC FOX, a joint German-Finnish campaign against Soviet Northern Front defenses at Salla, Finland. Russian Front - Finland: Day 118 of 164 of the Battle of Hanko. The Soviets will be forced off their leased naval base. Russian Front: Day 118 of 167 of Germany's Operation BARBAROSSA. Russian Front - North: Day 40 of 872 of the Siege of Leningrad. Russian Front - Center: Day 16 of 98 of the Battle of Moscow. Russian Front - South: Taganrog on the Sea of Azov is captured by German Army Group South. MTO - Libya: Day 191 of 256 of the Siege of Tobruk. East Africa: Day 495 of 537 of Italy's East African campaign in the lands south of Egypt. CBI - China: Day 1,564 of 2,987 of the 2nd Sino-Japanese War. Russian Front - North: Day 405 of 872 of the Siege of Leningrad. Russian Front - North: Day 166 of 658 of the Siege of the Kholm Pocket, USSR lays siege to the Kholm Pocket but the Germans hold out for a about a year and a half. Russian Front - South: Day 112 of 150 of Germany's CASE BLUE, the failed offensive to take the Caucasus oil fields. Russian Front - South: Day 56 of 165 of the Battle of Stalingrad, bloodiest battle in human history. East Africa: Day 166 of 186 of the Battle of Madagascar. CBI - China: Day 1,929 of 2,987 of the 2nd Sino-Japanese War. PTO - Alaska: Day 133 of 435 of the Battle of Kiska, Aleutian Islands. The US and Canada will defeat the Japanese invaders. PTO - Malaya: Day 241 of 357 of the Battle of Timor Island, a long guerrilla war ending in Japanese victory. PTO - New Guinea: Day 89 of 119 of the Battle of the Kokoda Track. The Australians continue pushing back the Japanese troops. PTO - Solomon Islands: Day 72 of 187 of the Battle of Guadalcanal. Russian Front - North: Day 770 of 872 of the Siege of Leningrad. Russian Front - North: Day 531 of 658 of the Siege of the Kholm Pocket. USSR lays siege to the Kholm Pocket but the Germans hold out for a about a year and a half. Russian Front - South: Day 55 of 122 of the Battle of the Lower Dnieper River, USSR. Russian Front - South: Day 2 of 4 of a Soviet attempt to breakout from the Bukrin Bridgehead south of Kiev. MTO -Italy: US 12th Air Force light and medium bombers hit tactical targets in support of US 5th Army. CBI - China: Day 2,294 of 2,987 of the 2nd Sino-Japanese War. CBI - India: The US and Japan exchange 3,000 civilian prisoners in neutral Goa, then a Portuguese colony, today a part of India. PTO - New Guinea: Day 29 of 219 of the Battle of Shaggy Ridge. PTO - New Guinea: Day 26 of 162 of the Battle of the Huon Peninsula. Will result in an Allied victory. ETO - France: Day 78 of 284 of the Battle of Brittany. ETO - Belgium: Day 46 of 62 of the liberation of Belgium. ETO - Belgium: Day 16 of 38 of the Battle of the Scheldt Estuary. ETO - France: Day 33 of 236 of the Siege of Dunkirk. ETO - Germany: Day 29 of 145 of the Battle of Hürtgen Forest. Russian Front - Finland: Day 33 of 223 of the Lapland War. Finland and Russia have joined forces to kick the Germans out of Finland's most northern province. Russian Front - Finland: Day 11 of 23 of the Petsamo-Kirkenes Offensive. The Soviets will drive the Germans out of the Arctic region in northern Scandinavia. Soviets continue heading toward Norway. Russian Front - North: Day 34 of 41 of the Battle of Riga, Latvia. Russian Front - Center: Day 3 of 206 of the Battle of the Courland Pocket in Latvia. Germans will hold this area until the very end of the war. Russian Front - Center: Day 13 of 18 of the Battle of Memel, a border town of Lithuania and East Prussia. The Germans continue to hold the Niemen line to cover East Prussia. Russian Front - Center: Day 34 of 72 of the Battle into East Prussia and northern Poland. Russian Front - Center: Day 2 of 15 of the Battle of Goldap, East Prussia. Russian Front - South: Day 12 of 24 of the Battle of Debrecen, Hungary. German Army Group South successfully repel heavy Soviet attacks near Debrecen. Russian Front - South: Day 34 of 72 of the Battle of Belgrade, Yugoslavia. MTO: US 15th Air Force: Heavy bombers hit targets at Germany, Austria, Hungary and Yugoslavia. MTO - Italy: US 12th Air Force fighters provide air support in the battle area south of Bologna. CBI - Burma: Day 200 of 302 of the Chinese Salween Offensive in Burma. CBI - China: Day 2,660 of 2,987 of the 2nd Sino-Japanese War. Day 184 of 259 of Japan's Operation ICHI-GO. PTO - New Guinea: Day 308 of 597 of the Battle of New Britain. PTO - New Guinea: Day 179 of 481 of the Battle of Western New Guinea. PTO - Palau Islands: Day 33 of 74 of the Battle of Peleliu (Operation STALEMATE II). PTO - Palau Islands: Day 31 of 36 of the Battle of Angaur.